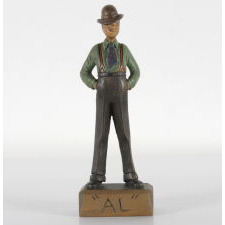 Hand-carved wooden figure of New York Governor Al Smith, who ran for President of the United States on the Democrat ticket in 1928 against Herbert Hoover. 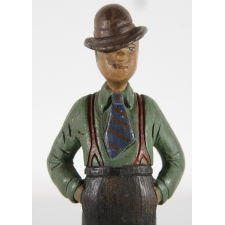 With nice folk quality and wonderfully hand-painted, the born-and-bred New Yorker sports suspenders, a bowler hat, and a cigar stub in his teeth. 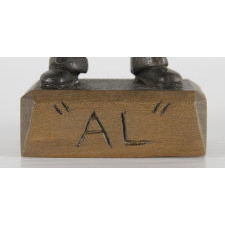 The front of the simple, rectangular block on which he stands reads simply "Al," accurately reflecting his status as an "average Joe." The carving probably dates to the 1828 election year specifically, when interest in displaying his likeness would have been at its height. 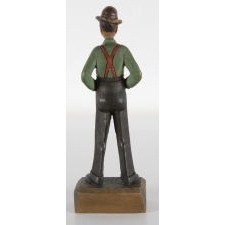 The oxidation and the style of the work are both indicative of this date. Alfred Emanuel Smith, Jr. was born on December 30th, 1873, and grew up on Manhattan’s lower east side. His grandparents were of Irish, German, Italian, and English descent, but he most easily identified with the Irish American community and would eventually become its leading spokesman. In 1895, Smith became clerk in office of the Commissioner of Jurors. In 1903, he was elected to the New York State Assembly. In 1911, after 146 workers died in the Triangle Shirtwaist Factory fire, he held strong to his roots and was appointed vice chairman of the commission appointed to investigate the fire. 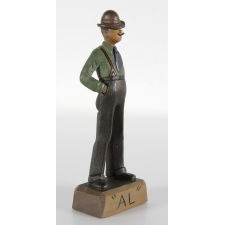 Backed by Tammany Hall, he soon became known as a crusader for workers’ rights, championing legislation against dangerous and unhealthy work environments. By 1915, Smith was seen as a leader of the Progressive movement in New York City and rose quickly through the political ranks. He was elected Sheriff of New York County in that year, then President of the board of Alderman of the City of New York in 1917, and finally obtained the Governor’s chair in 1918. He lost his bid for reelection in 1920 after speaking out against William Randolph Hearst, a sensationalist newspaperman who was the leader of the populist right wing of the Democratic Party and had teamed with Tammany Hall to elect local administration. But he mended this transgression and re-won the governorship in 1922, 1924, and 1926. In 1928 Smith firmly etched his place in American history, when he became the first Catholic to be nominated to run for the Whitehouse on a major party ticket. Though he brought millions of Catholic voters to the polls for the first time, especially women, he lost to Herbert Hoover in the election, mostly due to his outspoken stance against Prohibition and a general fear that he would answer to the Pope before the Constitution. 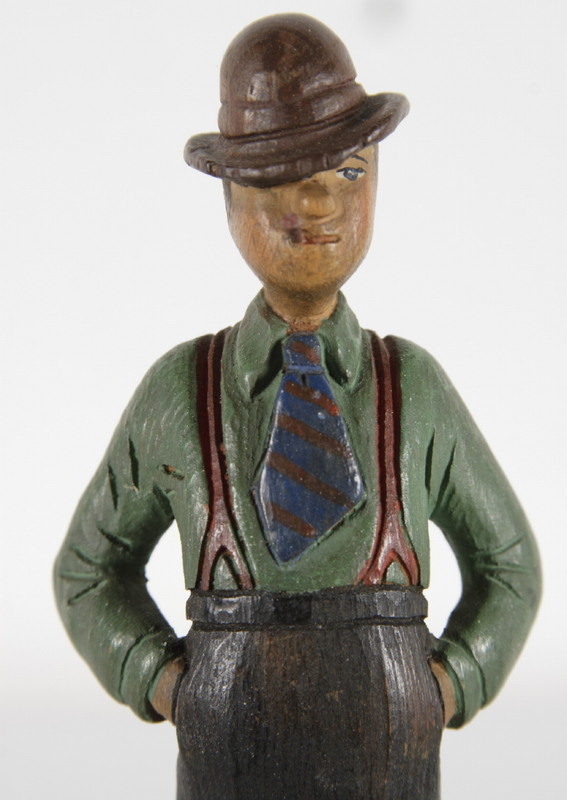 Condition: There is a chip in the bowler hat on the reverse. Otherwise excellent, with extremely minor wear.